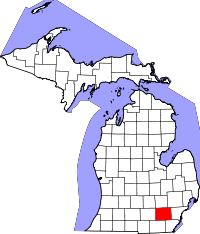 Washtenaw County, home to the county seat of Ann Arbor, is generally an upper-middle class area. Five universities reside within the county borders, which is located very close to the huge city of Detroit. The Vital Records Division and Genealogy Department of the Clerk/Register of Deeds office handles the indexing and distributing of the county's vital records. The genealogy research area, which is open Tuesday through Thursday from 9:00AM to 4:00PM, requires appointments be made prior to visiting. All mail-in applications to obtain copies of records are provided on the website, which, in addition, can also be purchased via the county's database online. Death records listed from 1959, and marriage records beginning in 1963 are open and free to search. Records actually located at the Clerk office have a much larger range of available years, and staff is on-hand to assist with searching.